Lilly on the boat with mallard drake. 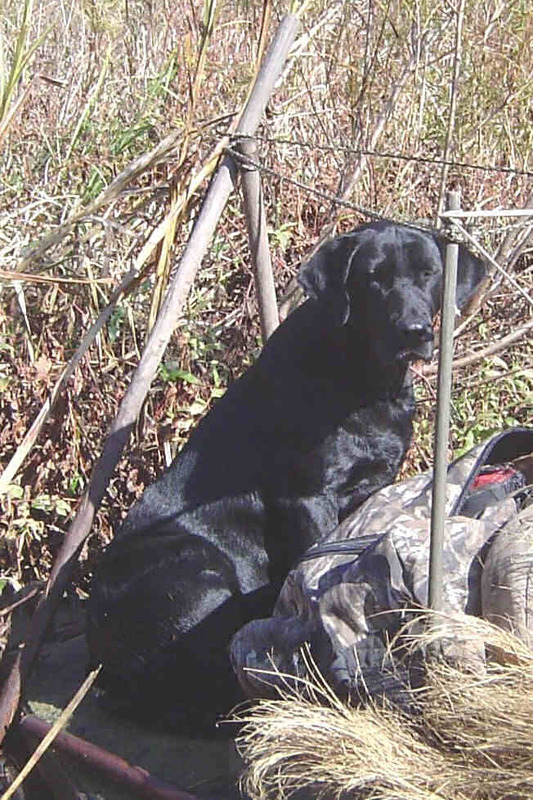 Using a retriever in your boat is an important part of the hunt. My personal preference is a female Lab. Besides being easy to train, they don't weigh as much as males. I do, however, have friends with 85-90 lb. males that are excellent boat dogs. The key here is a well behaved dog. Don't expect your dog to perform well without some training. There are some special situations which require training above and beyond normal retrieving duties. Your dog will stay outside of the cockpit which reduces water in the boat and keeps you dry. I attach a piece of indoor/outdoor carpet on the boat for her lie comfortably. The carpet also allows your dog to grip an otherwise slippery surface. Exits from the boat are much more stable and graceful with the aid of the carpet. Nine times out of ten, when you give your dog a line on a downed bird, the line will go through the middle of your boat or your hunting partner's boat. Training is necessary to teach your dog the correct line, which is not through anyone's boat. The same goes for after the bird is retrieved. Your dog must swim around to the back to get on the boat. In deep water they will put both front feet on the boat. When they do, place your hand on the back of their head. They will naturally arch their back, which will allow you to pull them onto the boat. This is easy with a 60 lb. dog; not so easy with a 90 lb. dog. I have trained my dog not to shake until I get the bird from her. This allows me to position her so water will not get inside the cockpit. To do this your retriever must hold the bird until you ask for it. It is an easy step from there to teach when to shake. Remember the whole idea of this system is to be comfortable. Comfortable in my book means dry. As added protection from dog water I erect a splash guard between my dog and the cockpit. I just cut a piece of plastic tarp and attach it to my blind frame with binder clips. The splash guard also acts as a wind break if you have set up with the wind at your back. You will find that your dog will train you as much as you train him. I use to try and keep my dog facing the direction I thought she would have the best view. After retrieving hundreds of ducks she has decided she knows which is the best way to sit. She rarely misses a mark, so I don't care which way she faces. The bottom line on dogs and boats is they must have boat manners. If they don't; train them, leave them at home or don't hunt out of a boat. If you do take an untrained dog in your boat, don't hunt with any of your friends.